At once realistic and fantastical, romantic and brutal, joyous and cynical, La Baie des Anges (The Bay of Angels) suspends us in the endless spin of the roulette wheel before the ball is caught. A tale of gambling, love, seduction and obsession is laid out on the betting tables and painted on the sun-bleached promenades of the French Riviera. Although Jacques Demy achieved international recognition for his upbeat musical extravaganzas Les Parapluies de Cherbourg (1964) and Les Demoiselles de Rochefort (1967) his repertoire is more diverse than song and dance routines, outlandishly hip as they are. Lola (1961) and La Baie des Anges, his first two feature films, are arguably amongst the more accomplished of the nouvelle vague era. Marginalized in importance as a member of the French New Wave, his films nevertheless betray some of the key characteristics in the movement away from the prevalent cinema de papa (old fogey’s cinema), seen in his glorious provincial locations, exuberant mise en scène, existential characters and love of American cinema. He was undoubtedly an auteur, and his signature was bittersweet utopia tasted with tangible energy. La Baie des Anges is a simple story of love between bank clerk-turned-novice-gambler Jean (Claude Mann) and the delectable Jackie (Jeanne Moreau), a seasoned veteran of the casinos, as they surf the waves of fortune in search of the next lucky splash. Jean is seduced in almost equal measures by the charms of the game and those of the girl, gradually relinquishing control of his morals and his money. Their journey merely wanders amongst casinos from Nice to Monte Carlo, guided by Jackie’s fixated compulsion to play regardless of the outcome. The couple are in many ways diametrically opposed to one another, reflecting the numerous oppositional elements in the film: odds and evens, red and black, light and darkness, winning and losing, reality and fairy-tale. Jackie’s all-white attire, complete with a platinum blonde bouffant, visually counterbalances Jean’s (and in fact almost everyone else’s) dark tones, and singles her out in luminosity. The light that constantly bathes her reinforces this effect, letting Jean stand in the shadows, face down, often out of focus even when he is in the foreground of the shot and she the background. She is spontaneous, he pragmatic; she flamboyant, he reserved; she flighty, he steady; she smokes, he abstains, though he is always ready to light her cigarette. As he is spun closer into her web of addiction, however, he loses the edge to his typical restraint: by the time they have reached Monte Carlo it is he who suggests they stay on for another spin. Interestingly, here he wears a white jacket and she a black gown. They have begun to incorporate their symbiotic characteristics, developing into fuller personalities. Demy owes much to the talents of Jean Rabier for the cinematography and Michel Legrand for the score, both of which keep rein on the somewhat rambling plot. Beautiful wide-screen camerawork in and around Nice is punctuated by repeated motifs – large overhead lamps, rows of arches, and banisters, trellises and bedsteads dancing arabesques. Legrand’s lilting music blends optimism with nostalgia and tempers the romance with a sense of imminent loss. These aesthetic elements infuse the film with a quality that is unmistakably French. 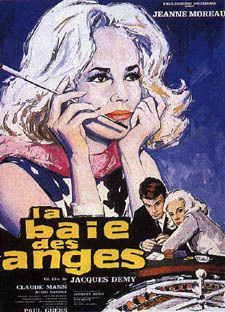 The theme that dominates La Baie des Anges most explicitly is chance, and particularly the “mysteries of figures.” Despite, or perhaps, in a perverse way because of their random unpredictability, numbers are to be trusted more than people, who cheat, lie and betray throughout the film. Jackie denounces money as her motivation to gamble, arguing that if she loved it she wouldn’t waste it. “What I love about playing is those crazy swings from luxury to poverty… the unknown…” she says to Jean. Gambling is her religion, providing her spiritual (and even sexual) succour. By filming the lovers from a height Demy adds an extra dimension to the religious aspect, engendering a helpless awareness of fate. The film’s happy ending springs up so suddenly that the roulette wheel is left spinning: significantly we never know whether Jackie wins or loses. Happiness too seems regulated by the enigmatic logic of mathematical probability, and can achieve only a transient status. Demy checks the sentimental romance of La Baie des Anges with allusions to the darker, grittier side of obsession. Jean attacks Jackie for having no heart, no real emotions, and no care for anyone but herself. Her nihilistic retort questions the validity of human affection, and illustrates succinctly the destructiveness of self-hating solitude. Violence and abuse loiter with intent in this low-point of the film. Le cinema de Jacques a cette double personnalite; sentiments serieux aux raciness profondes et fleurs si legeres qu’on dirait des flocons de neige ensoleillee.